Because of the shutdown in United States of America, President Trump was forced to cancel some international meetings held outside the USA. USA is also a latest victim of a cyclone, President Trump was always seen with the victims, consoling them. 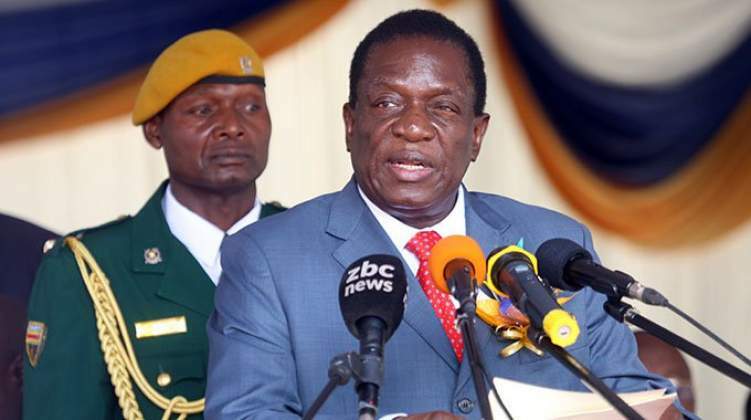 I thought that President ED Mnangagwa learned from his aborted trip when there was a massive demo that claimed 17 in January 2019. I am now forced to accept that President ED Mnangagwa has incompetent advisors or he may not be following their advice. Allegations from the media are that, Zimbabwean hospitals are dry, facing a serious shortage of drugs and even gloves. Surprisingly, the minister of health is blaming sanctions for these shortages. I have not heard of a concrete solution from the government pertaining to the health crisis. What I only heard was that President ED Mnangagwa is off to Abu Dhabi for bilateral talks. The minister of health declared that he managed to secure $1 million for the drugs, an amount that is insufficient and unsustainable compared to the challenges facing our hospitals. How much is the Abu Dhabi trip going to cost the tax payers? It could have been wise if that money was to be channeled towards health or cyclone Idai disaster management. Let me take this opportunity to express my condolences to the families and friends who lost their loved ones because of the ongoing cyclone. They are all in my prayers. Before President ED left for Abu Dhabi, the cyclone had already killed scores in Mozambique and South Africa and the weathermen had already warned Zimbabwe to be vigilant. However, before the cyclone hits some parts of Zimbabwe, I was shocked to learn that President Mnangagwa was already on air visiting Abu Dhabi for bilateral talks. The deaths reported in South Africa and Mozambique could have alerted President ED Mnangagwa to cancel the Abu Dhabi trip. I thought he learned from President Trump and others like President Magufuli of Tanzania who has already canceled a lot of international trips because of the inevitable challenges that require his attention at home. President ED Mnangagwa should have shown seriousness and be with the victims of the cyclone at home during this hour of need. I want to urge President ED Mnangagwa to be considerate and show love to his people. His team saw all these coming but failed to advise the president to stay at home. This cyclone is going to leave the weak Zimbabwe's economy weak. The disaster comes at a time when the government is failing to purchase even gloves and painkillers. It pains me that school children are reported to have been killed while their President is away at the expense of tax payers' money. I am informed that scores of people were injured due to the effects of the cyclone while media allegations are that hospitals have no medicine. This is definitely going to be a double tragedy but we will conquer as a team, Hopewell Chin'ono's effort to mobilize heath support from Zimbabweans in diaspora is noble. I want to express my special thanks to him for such a brilliant effort hoping that his effort may not be taken as part of regime change. The health challenges and cyclone are definitely going to leave President ED Mnangagwa a helpless and hopeless man. He should sit down with Nelson Chamisa instead of going to Abu Dhabi. Nelson Chamisa and his team are capable of helping President ED Mnangagwa to solve our challenges. The President should avoid unnecessary trips and only attend key meetings that are not expensive for the country.